Yellow cake mix and ready-to-spread frosting make these home-baked drop cookies easy. Lemon zest and juice add flavour to both the dough and icing. Drop rounded teaspoonfuls of dough, 2 inches apart, onto baking sheets sprayed with cooking spray. Bake 9 to 11 min. or until edges of cookies are lightly browned. (Cookies will be soft but will firm up upon cooling.) 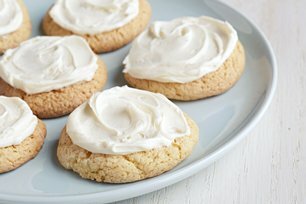 Cool cookies on baking sheet 1 min. Remove to wire racks; cool completely. Mix frosting and lemon juice until blended; spread onto cookies. Use a #70 spring-handled small ice cream scoop to get rounded teaspoonful-sized balls of dough.